Today I have a Halloween card to share, I love all the halloween images and the colours (except the really scary ones), I decorate the house with ceramic pumpkins that have tea lights in them and a couple of fluffy bats with glittery eyes ~ then I go lock the gate so no one came come trick or treating ~ lol! I just can't cope with large groups of children in ghoulish costumes standing on my doorstep and it drives the dogs crazy (we have a buzzer on our gate that goes off every time it is opened and this sets the dogs off). Having said that, our drive is very long and dark, so scary enough that most children won't brave it! I know I said in my last post that I would be sharing another commission card with you all ~ but I just couldn't resist doing a halloween creation. 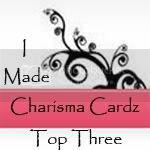 I will share the commission card next week. Punches (for cobwebs): Martha Stewart ~ 'Spiderweb' (Sorry but I can't find a supplier who has this (I purchased mine from a company in Australia)!! 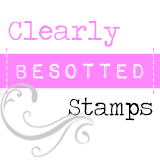 Tim Holtz Distress Stickles ~ 'Rock Candy' (used on hat, but not showing up on photo! So that's it for today ~ thank you for stopping by and for leaving any scrumptious comments for me to read. 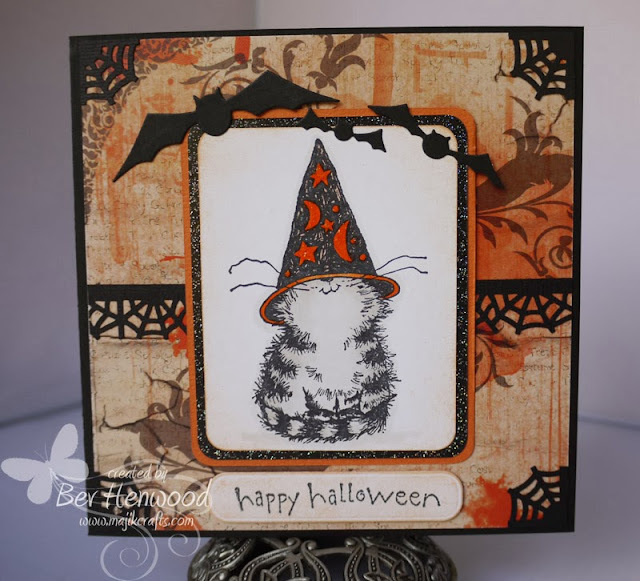 Super Halloween card, great image, thanks for sharing at Fab'n'Funky. This is a beautiful image and a lovely card. Really like your background and the colors. Have a nice Halloween night!!!! I know what Fraz is like with the doorbell ringing, so lord only know what all your brew are like when one starts - lol, so don't blame you for locking the gates!! !